Louisville, Ky. has long been home to spectacle, pageantry, and competition, and on Monday, July 7, Papa John's Cardinal Stadium welcomed eight Drum Corps International units for the DCI Louisville Premier Event. The Cavaliers (1st, 84.750) marched through Louisville unscathed and undefeated with their "Samurai" production, opening up an impressive lead of more than four points from their nearest rivals. Silver and bronze medal positions were snagged by Ohio's two corps, with the Bluecoats (2nd, 80.250) and Glassmen (3rd, 76.500) showing off a pair of theatrical programs, though in very different styles. "The Knockout," the Bluecoats' production, follows the struggle of a contender to become a champion, while "Kar-ne-vel" performed by the Glassmen is a series of moods befitting a circus or other festival atmosphere. The Colts (4th, 75.450) and Blue Stars (5th, 75.300) continue to nip at the heels of the Glassmen, while the Madison Scouts (6th, 72.250) and Pioneer (7th, 65.050) rounded out tonight's World Class competition. Performing last in the Louisville lineup, the Colts drum majors said that the audience was at the forefront of their consciousness. "Entertaining the audience is something we've tried to make our trademark – having melody in our show that's both recognizable and singable," said drum major Keenan Cox. "We want to present something that the audience members can listen to and go away feeling like they understood and made a connection to the show." As for tonight's performance, Cox said, "We came off the show last night (Michigan City, Ind.) feeling like it just wasn't quite what we're capable of, and we came out tonight and we got it." As tonight's sole representative of the Open Class, Revolution stood alone as the only medalist. With a score of 68.150, the corps' program "e.le.va.tion" has become something of a self-fulfilling prophecy, as the corps tries to elevate its competitive edge. 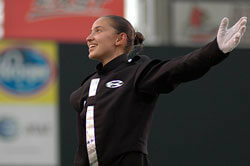 Drum major Amanda Montalvo said, "We've usually done simpler shows which are easier to march. This show is a step up for the program. This year we have harder music and more complex drill, so putting it all together is a good thing for the 'e.le.va.tion' process." As further "elevating" step, Revolution this summer has continued to expand its tour schedule, roving far from its hometown of San Antonio, Texas. For the members, it's a more rigorous schedule than many Open Class corps experience, but drum major Angelica Juarez can attest that she loves it. She said, "I didn't really know what to expect going in, but it's been a blast. I love travelling. I hadn't been out of Texas but once before this. It's quite an experience for me." Revolution has a week off from competitions after the Louisville event, but many of the World Class corps from tonight's competition will arrive this weekend at the DCI Premier Events in Denver, Colo. and Orlando, Fla. The Cavaliers will head west to test their undefeated streak against the Blue Devils for the first time this season, while in the Sunshine State the Bluecoats will attempt to "knock out" Carolina Crown and the Cadets, while moving up the rankings.